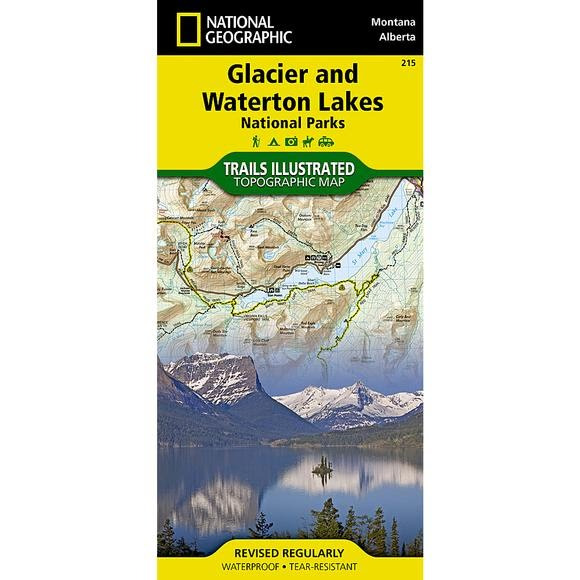 National Geographic's Trails Illustrated map of Glacier and Waterton Lakes National Parks offers unparalleled detail for outdoor enthusiasts exploring the pristine landscape of forests, mountains, lakes, and meadows within these two spectacular parks. National Geographic&apos;s Trails Illustrated map of Glacier and Waterton Lakes National Parks offers unparalleled detail for outdoor enthusiasts exploring the pristine landscape of forests, mountains, lakes, and meadows within these two spectacular parks. Created in partnership with local land management agencies, this expertly researched map features key areas of interest including Many Glacier, Great Bear Wilderness, Flathead National Forest, Hungry Horse Reservoir, Lake McDonald, Flathead River, St. Mary Lake, Akamina-Kishinena Provincial Park, and the Waterton Lakes. Other features found on this map include: Apgar Mountains, Bowman Lake, Flathead National Forest, Flathead Range, Glacier, Great Bear Wilderness, Kintla Lake, Lake McDonald, Lake Sherburne, Lewis and Clark National Forest, Lewis Range, Livingston Range, Lower Saint Mary Lake, Mount Carter, Mount Cleveland, Mount Saint Nicholas, Mount Stimson, Saint Mary Lake, Upper Waterton Lake, Whitefish Lake.